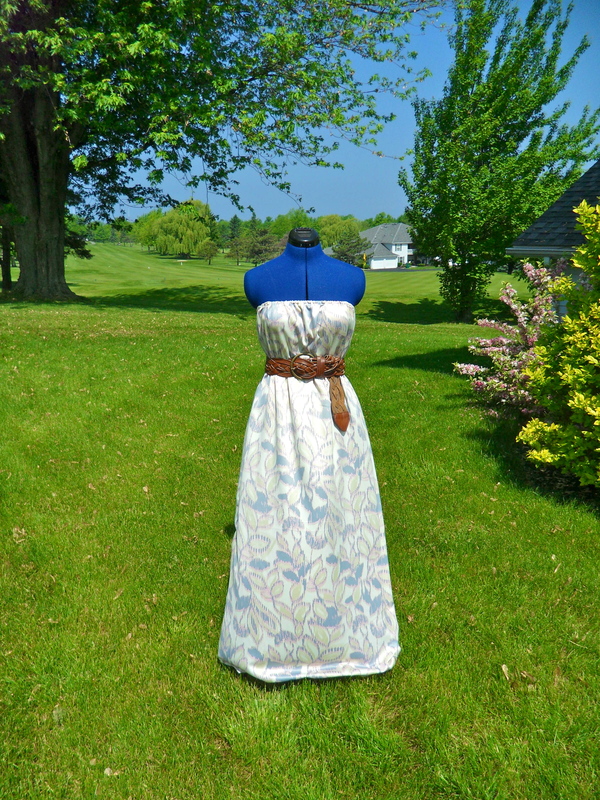 As promised via twitter, here is my first post to help get you ready for Memorial Day weekend… an incredibly simple maxi dress! I have had this pattern (McCall’s M6558) forever and completely forgot about it. I stumbled across it while looking for a different one and immediately wanted to try it. 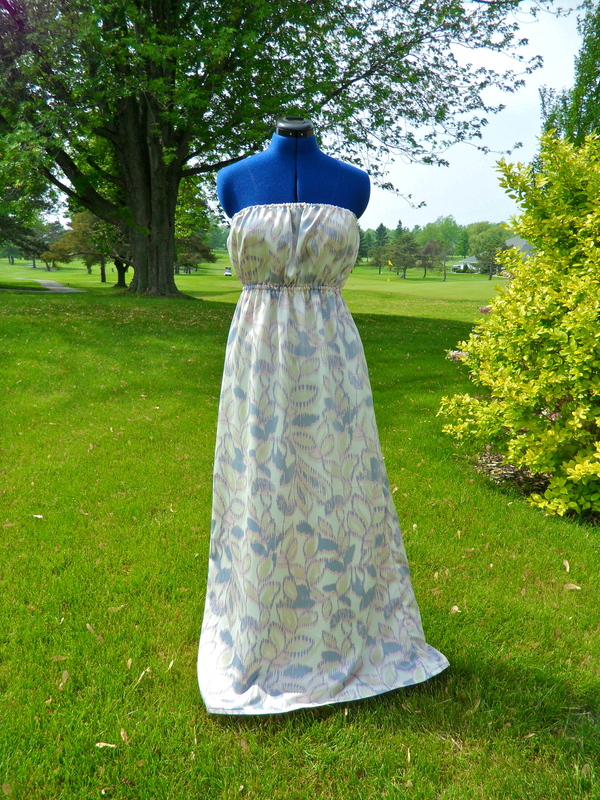 I live in maxi dressed in the summer time and I’m always looking for great patterns to make my own (I collect fabrics all winter long just waiting for warm weather to hit!). This fabric is a silk blend that I got from our red tag fabrics at Joann’s for 2$ a yard. I honestly didn’t think this fabric would work for this dress (the pattern called for knit, broadcloth and gauze fabrics) but I’m so glad I tried it because it worked wonderfully! When I tell you that this dress took less than an hour to make, I’m not exaggerating! There are only 3 pattern pieces to cut (4 to sew) and aside from making the casing for the 2 elastic bands, it could not be easier! Since it’s such an easy pattern, it would be perfect to make for this weekend. Lightweight and flowing, it’s a great way to look stylish while beating the heat!! Truth be told, when I finished the dress I didn’t like it at all (I thought the elastic bands made it look like something made in a Home Economics class lol).After playing around with belts and jewelry, I realized this dress is made by the accessories. 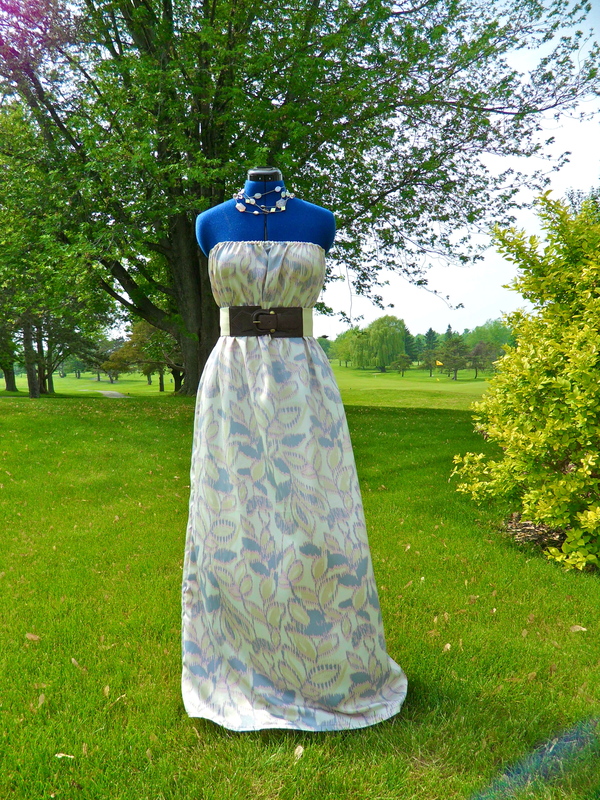 By using wide belts to cover the waistband, this dress takes on a whole different look which I liked much more. I plan to wear this maxi dress this weekend with one of the two belts featured without a necklace, with a rose gold watch and a stack of rose gold bangles. 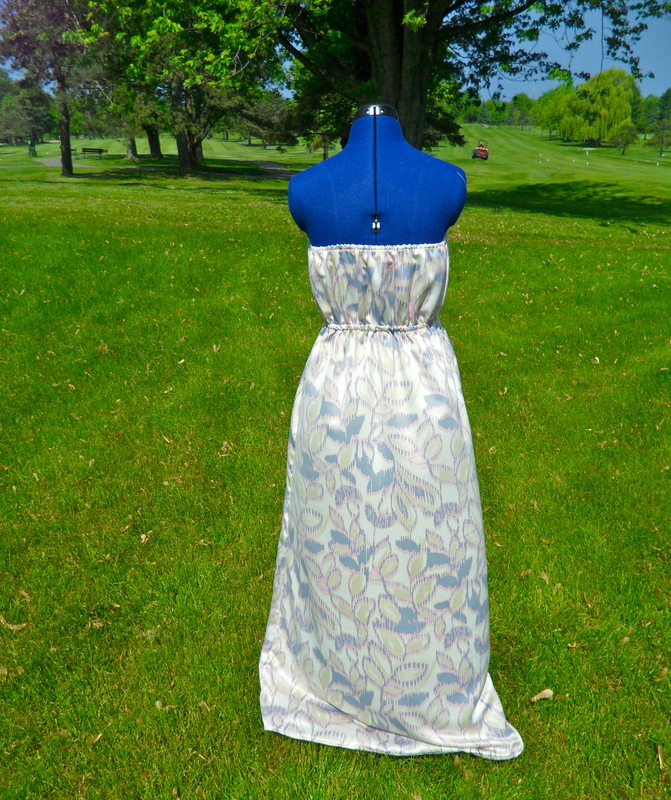 ** Want another simple dress DIY that doesn’t require a pattern? Check out my caftan dress post! 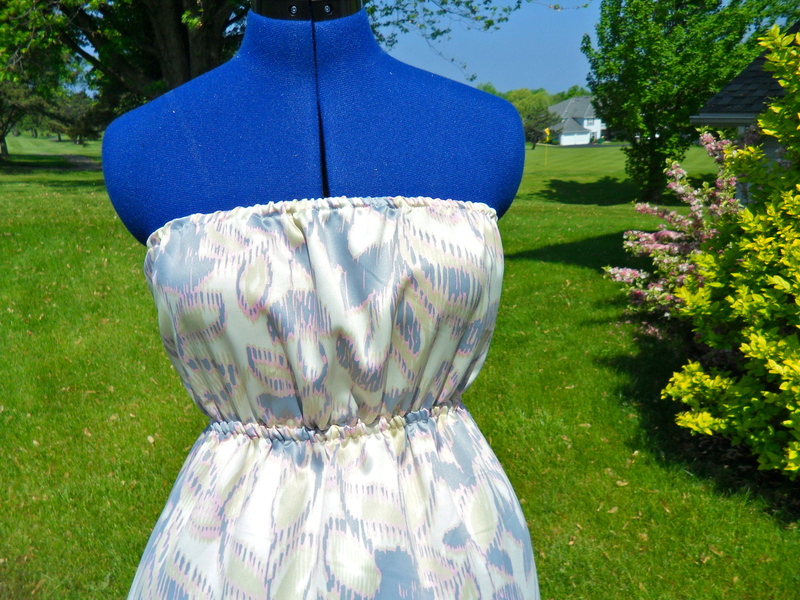 *** Check out this updated post on a new and improved version of this dress! Cute dress! How do you measure the upper elastic so it stays up? I have to worry about sharing my “gifts” if the elastic isn’t tight enough! There are guides that come with the pattern… Although I will say I had to cut about 4 inches off the top piece and 6 around the waist one so they’d fit tight enough. The best part is you can insert the elastic through a small opening, try to dress on and adjust the elastic to any size before sewing it in place! Gorgeous! Will have to try! I love the dress. But how did u sew the elastic on the waist? Thank you! The instructions are in the pattern, but basically you attach the bodice to the skirt and then press the seam allowance towards the bodice and stitch along the edge to make the casing. I know this post is old, and I’m rather knew to sewing and making my own clothes… But if I wanted to make the dress longer than what the pattern says I just measure it out? I’m 6 foot and have just recently decided to try and take my clothes finding problems into my own hands. Yes! If you take the skirt pattern piece and add the extra inches following the lines on the bottom of that you can add length to the skirt! Just make sure to follow the original line on the pattern instead of just adding a few inches straight down on the fabric. Making your own clothes can be such a fun option and I would imagine make things much easier for someone as tall as you!